An abandoned home in Detroit. The American Civil Liberties Union, the National Consumer Law Center and others have sued investment bank giant Morgan Stanley on behalf of five black Detroit homeowners. They say Morgan Stanley encouraged a now-defunct subprime mortgage lender, New Century Mortgage Corp., to push the high-risk loans in predominantly black neighborhoods. Morgan Stanley then profited from selling those loans on the mortgage securities market before the housing market collapsed, the lawsuit alleges. 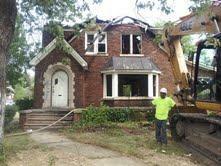 The result, said Michigan ACLU Director Kary Moss, was devastation in many Detroit neighborhoods. Moss said the ACLU chose Detroit because data shows that’s where New Century’s loans did the most damage. “So that data, coupled with direct evidence that we’ll have from witnesses and our plaintiffs, will tell a story of discrimination,” Moss said. The ACLU alleges that Morgan Stanley’s actions violated the 1968 Fair Housing Act, and other federal anti-housing discrimination laws. The lawsuit was filed in a New York federal court because it’s “right in Morgan Stanley’s and Wall Street’s backyard,” said national ACLU Chairman Anthony Romero. The ACLU says this is the first suit to draw a direct link between racial discrimination, predatory lending, and a financial institution that securitized and sold mortgages. Though there are only 5 plaintiffs so far, but the lawsuit seeks class-action status. The ACLU says as many as 3500 others. One of the plaintiffs is Charmaine Williams. She lost her home on the city’s east side last year, after re-financing with New Century in 2007. She said many of her neighbors had done the same thing, and the neighborhood went into a quick downward spiral. A Morgan Stanley spokeswoman had this response to the lawsuit: "We believe these allegations are completely without merit and plan to defend ourselves vigorously." A group of anti-foreclosure activists says Chase bank continues to wrongly foreclose on people’s homes. And as part of the “Occupy our Homes” movement, they plan to fight for eight Metro Detroit homeowners they say are victims. Chase bank and other mortgage lenders signed a consent agreement with the federal government in the wake of the national foreclosure crisis. Wayne County has finished the first round of what’s been called the "world's largest property auction." The county is trying to get rid of more than 22,000 tax-foreclosed properties by auction. More than 20,000 of them are in Detroit. 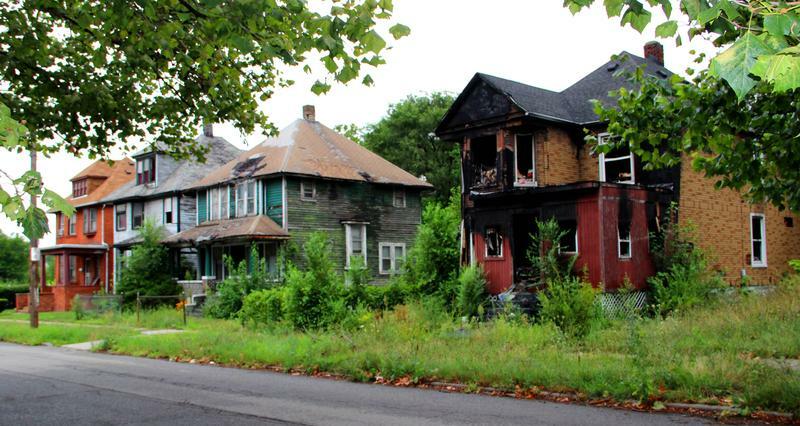 But despite the glut of vacant properties, housing prices are headed up in certain areas of the city. Bob Dorsey is chief analytics-officer with F.N.C., which tracks housing prices nationwide every month. "We've noticed that there are certain neighborhoods that have done extremely well, and others that have are still very flat or even declining," said Dorsey. Dorsey said many investors see money in an expanding rental market in Detroit, and nationwide. Leaders in Detroit’s downtown and midtown areas say housing demand now out-paces supply there. A Detroit-based group of activists is working through the summer to help people facing foreclosure stay in their homes. The Detroit Eviction Defense Coalition is affiliated with the Occupy Detroit movement. They held a rally Monday at the McNamara federal building to support Detroit homeowner Jennifer Britt, who faces eviction after a lengthy legal battle.